Get your Sock Monkey Book! Learn to count with Sock Monkeys. Great for night-time reading to little learners. This little book is stuffed with character and creativity. The sock monkeys have a loveable humor and sincerity that comes from the hearts and fingers of all the many people who sewed them. Want to Smile? Want to Giggle? Escape to the whimsical world of Monkey Made of Sockies, where each turn of the page is like comfort food for the heart. Filled with sock monkey mythology, urban legend, tall tales, short stories, facts and fictions. 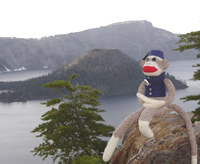 Sock Monkey Dreams is the book sock monkeys and sock monkey fans have been waiting for. a warped look at the world we live in, as seen behind button eyes. :: Everything’s Coming Up Sock Monkeys! It’s beautiful, it has tons of history and art all about Sock Monkeys. 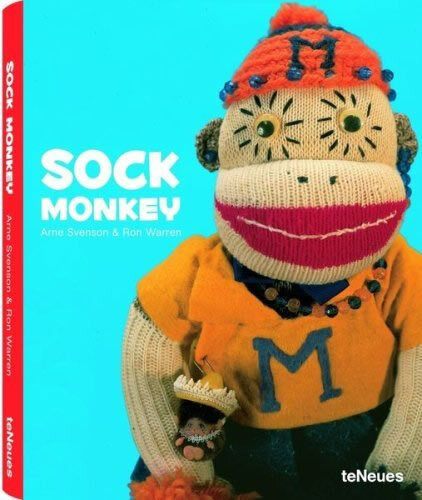 It would be a great addition to the library or coffee table of any Sock Monkey enthusiast. Our favorite of the series is Sock Monkey Boogie Woogie, but Sock Monkey goes to Hollywood and Sock Monkey Rides Again are great too!. In 1985 Ron Warren began collecting sock monkeys, alot of Sock Monkeys. With disturbing obsession he seeks to document every one of the more than 1,800 examples. "Told with the same edgy, sarcastic tone that has made him (Jillette) so distinctive." Monkey Love celebrates our love affair with this smiling little character and honors the affection people have for their past and the devotion people share with others today. Check out her new Sock Monkey book. Send this book to a friend to knock their socks off. :: Do you have a Sock Monkey Book you want added here? Contact Ceru to get your Book added here. Need just a pair or two of Rockford Socks? All Socks are new and first quality. These socks make a Sock Monkey 20 inches tall. Do you want a real pair of true Vintage Nelson Socks? They can be hard to find. All Vintage Socks are unused, top quality and ready to be made into Monkeys. What is the difference between "vintage" and normal Sock Monkey Socks? How can I tell?